Coca-Cola in the UK has delivered a new gift in the form of a beverage in the lead-up to Christmas. 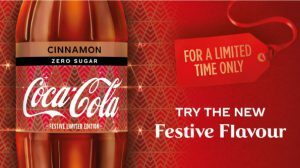 The ‘Festive Limited Edition’ Cinnamon Coke has hit shelves across Great Britain and is one of the variants in the Zero Sugar range. According to Pedestrian TV, the drink will be stocked through until the end of the year and the announcement from Coke said it is “a drink full of festive flavour” and was “launched in response to consumers’ love of the flavour”. “The new cinnamon flavour sits alongside the four other flavour variants in the UK’s Coke Zero Sugar line: original, peach, cherry, and vanilla,” Pedestrian TV said. C&I has contacted Coca-Cola Amatil in Australia to see if Cinnamon Coke will make its way to Australian shores.